cooking in Peru will surely include a variety of colorful and tasty Peruvian chili peppers in dishes such as ceviche, a medley of fish and shellfish, and anticuchos which is beef heart, marinated in spices, and grilled to perfection. One will learn to cook traditional dishes such as empanadas which are meat turnovers, or venture into preparing tripe stew or fried Guinea pig from the indigenous regions of the Andes. Regardless of experience, individuals touring Peru will relish in the rich diversity of flavors, aromas and tastes of traditional, as well as unusual, cuisine offered in this ancient land. 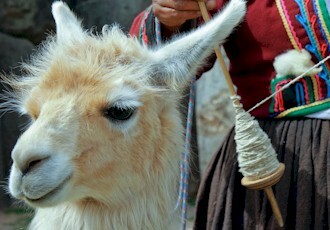 Fill in the form below and we'll send you an email with all our current deals for Peru. Cultural activities, sporting events, competitions, craft exhibitions and typical food tasting. People carry their crosses & take part in a race around Luricocha Main Square. Also celbrating more than 42 varieties of avocado. Celebrations continue throughout the week, with street fairs, expositions and plenty of regional food and drink. Dates Approximate. The feast day of St. John the Baptist. Events include fiestas with lots of music and regional cuisine. Colorful processions carry the image of the Virgen del Carmen through the streets of Lima, plenty of music and food along the route. Exhibition and selling of livestock, agro-industrial products, crafts and more. Dates approximate. Enjoy dances and typical food of the area. Dates approximate. The streets and main squares come alive with parades, fairs and a general spirit of celebration. Bars and restaurants providing plenty of pisco-related promotions. The best chefs of South & Latin America prepare their best dishes, while the public can come try all the food! Come with an appetite!